To all our clients, consultants, friends and collaborators, wishing you all the best for the holiday season and we look forward to seeing you in 2019. Our office will close on the 21st of December and re-open on the 14th of January 2019. Thank you to Sherrie and Najda for your excellent work on this year's Christmas Card! We are currently in the design phase of a new alterations and additions projects to an existing semi-detached dwelling in Five Dock. The pictured rear extension is a simple open volume containing the new open plan living, dining, kitchen and alfresco area that open to the backyard. The existing front portion of the existing dwelling is retained, to house the bedrooms and bathrooms. The landscaping of our House Howley project as designed by Melissa Wilson Landscape Architects has been featured in the December 8-9 Issue of The Weekend Australian Magazine. To read the full article or download the PDF click here. Our project in Russell Lea is nearing completion, with only a few joinery details and landscaping left to go before the clients move in. The design features face brickwork on the ground floor with a lightweight first floor filled with natural light through a variety of windows and skylights. Landscape design is by Melissa Wilson Landscape Architect. We wish our clients a very merry first Christmas in their new home. We have a new exciting project exploring the opportunity for a small dwelling in the backyard of an existing house. 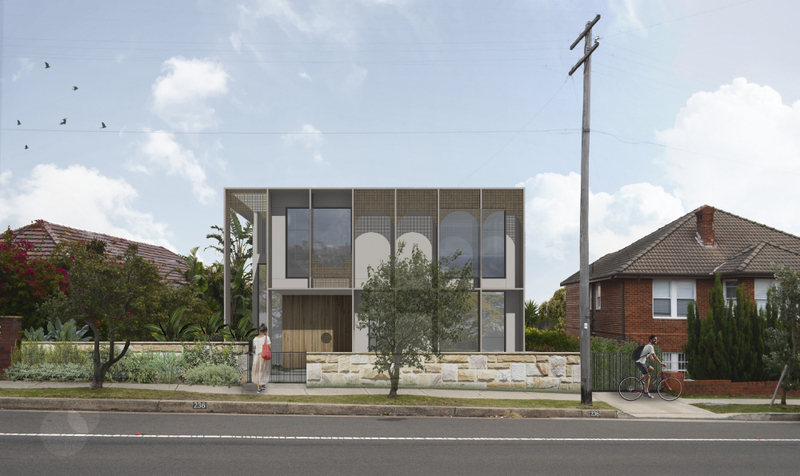 Located in a conservation area in Petersham, the project proposes a very compact dwelling which still incorporates all the elements desired for a comfortable lifestyle. The project promotes affordable, sustainable living in a market that is oversaturated with high housing costs. We have commenced work on a new project in Freshwater involving the refurbishment of a unique existing P&O style cottage. The project seeks to expose the unique P&O style front façade by demolishing the existing garage and replacing with a concrete carport. All the facades will be repainted white to bring back the nautical-deco style. The additions at the rear of the property include a new kitchen and alfresco space for entertaining. We have recently been collaborating with Hamish Watt Architect on his own house design in Abbotsford. The design features a unique frontage to the street consisting of twin white steel gables reminiscent of the historical boat sheds in the Abbotsford area. Construction began just before Christmas. The concrete for the ground level has been poured and we are looking forward to progress in the new year with our builder Ferrocon. We are delighted to be shortlisted in two categories this year in the 2018 Interior Design Excellence Awards. Our House Howley project is shortlisted for Single Residential Design, and our studio is included in the Emerging Designer list. We are looking forward to the awards night later this year and wish all the shortlisted practices the best of luck. See the full list of shortlisted entrants here. We are currently working on detailed documentation for a new house in Russell Lea. Named the RL House, the design proposes a series of ‘platforms’ cascading down the sloping site to a swimming pool in the backyard. Above this, a split level master bedroom/living room volume is lifted up and cantilevered out to capture the amazing district views. From the street, the house presents a minimal muted appearance concealing the spatial complexity beyond. We are expecting commencement on site early next year. We have recently lodged a Development Application for a new house in Vaucluse. The site is located along the ridge of Old South Head Rd and captures spectacular views of both the city skyline to the west and the ocean and harbour entry to the east. The design re-interprets contemporary Mediterranean landscape design and architecture to produce a dwelling with a sense of easy comfortable luxury. We recently collaborated with Professor David Sanderson (UNSW) on a competition entry for the 2019 MAAS Architectural Commission. Our proposal, titled 68.5 million, allows for visitors to participate in an immersive experience which recreates, to some small degree, the stages of a refugee’s journey once arriving in a foreign country: a journey of processing, incarceration, uncertainty and release. The use of ubiquitous shipping containers, designed to move non-human goods, underpins the dehumanising journeys most refugees make. 68.5 million is the number of people around the world who have been forced from their homes by disasters and conflict. Many of these flee their countries, and as refugees undertake perilous journeys to arrive in unwelcoming foreign countries. Then, if not returned to their country of origin, they are released into the city to make some kind of life. We are in the early stages of designing an extension to a character-filled cottage in Gladesville. The project will retain bedrooms in the existing dwelling, and provide a light-filled series of new courtyard and living spaces at the rear, complete with a pool and a cabana. We are currently in the design development stage of the project.